Before the new edition was announced, along with all the new mechs, the core mech was the Classic. Designed by Vincent, it was a very adaptable frame. I liked it so much I built several teams using the Classic frame. This is the first team of Classics I built with a unified theme and color scheme. The theme was an emphasis on melee weapons and the color scheme was Tan with Light Grey/Bley. This was the second team. It may have come number two on the program but its still number one in my heart. If you want to get picky, these guys were my first team of Classics. I bought them at my first Gencon. They were kitted out differently for a while, until I had the idea to re-create all the designs in the original rulebook using this kit. These guys were hanging around in my "to be finished" bin for a while. It took me a long time to gather the parts I needed. I'm still not sure I'm done muckin' about with 'em. Like I said, very adaptable. The Guardian: By varying the loadout on the Artillerist slightly you can make a mech with a different purpose. This design has two Artillery attachments, a split Direct Fire/Hand-to-Hand attachment, and one Defensive attachment. It's meant to sit and defend a station while shelling the rest of the board with the Artillery attachment. This was created by Soren Roberts. The Moving Wall: This design has two Defensive attachments, two Movement attachments, and a free d8 Movement attachments for having no ranged weapons. It provides cover for other fast mechs with no defense. In case of emergencies it can also sprint into HtH range to engage another mech with its White dice. The Shoot & Scoot: Designed to hit and run. Shoot fast, shoot hard, and run from cover to cover; it carries the weapons the Moving Wall cannot. It has two Direct Fire attachments, and two Movement attachments. Assault: This design has one Direct Fire attachment, one Defensive attachment, and one Movement attachment. 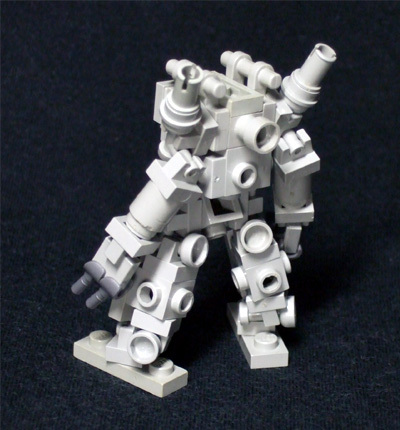 (2Rd/1B/1G/2W) A front-line, standard combat mech. It can take 25% less damage than the Soldier as it has one less attachment. Fast Assault: This design has one Direct Fire attachment, one Defensive attachment, and two Movement attachments. (2Rd/1B/2G/2W) A quick moving version of the Assault archetype. It should be used in a manner similar to the Swarmer. Armored Assault: This design has one Direct Fire attachment, two Defensive attachments, and one Movement attachment. (2Rd/2B/1G/2W) A sturdier version of the Assault archetype. Heavy Assault: This design has two Direct Fire attachments, one Defensive attachment, and one Movement attachment. (2Rd+d8/1B/1G/2W) Designed to follow the Closer into battle. Carrying Double Direct to improve its chances of hitting, while using Movement and Defense to improve survivability. The Swarmer: This design has two Hand-to-Hand Attachments, one Defensive attachment, one Spotting attachment, and the free d8 Movement attachment for having no ranged weapons. (2Rh+d8/1B/1Y/1Gd8/2W) Like the name suggests, use these in swarms of four or more. Gang up on a single target, each unit attacking and spotting for the next one in line. It relies on the higher damage rate of HtH -- 4 or better on the damage roll as opposed to 5 or 6, depending on cover, for ranged weapons -- and successive Spots to chew through individual mechs in the opposing force. Recon by Fire: Equipped with two Artillery attachments, and two Spotting attachments. (2Ra+d8/2Y/2W) This design can reach out and touch most of the table -- in one way or the other. Camp it out in a shooting blind at the beginning of the game and start wreaking havoc. This archetype was created by Malcolm Craig. The Charger: It carries one Direct Fire attachment, one Hand-to-Hand attachment, one Defensive attachment, and one Movement attachment. (2Rd/2Rh/1B/1G/2W) Like many other designs in MFZ, this is a front line combatant. I originally conceived of this Archetype as the "samurai". He has a Yumi (2Rd), a Katana (2Rh), armor (1B), and a horse (1G). 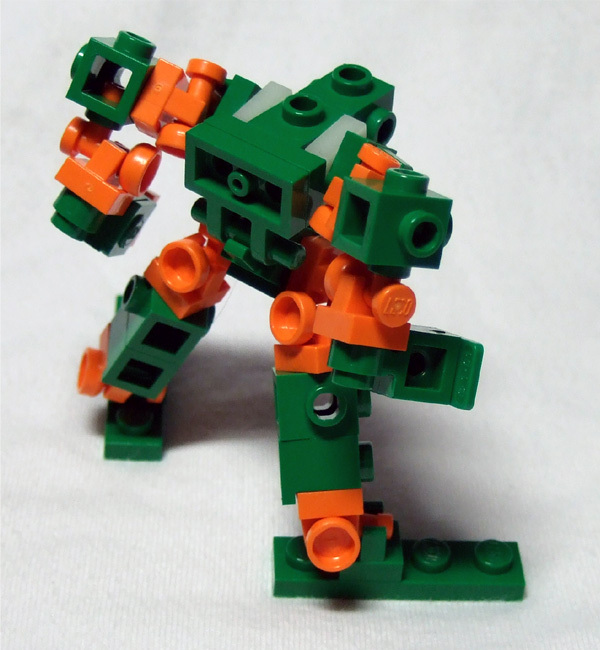 Tactically you use this mech like the Closer, ditching systems as you take damage while making your way to your opponent's Station. Unlike the Closer, you can ditch the systems in the order you want -- rather than in the specific order dictated for the Closer. The Binary: This design has one Artillery attachment, one Defensive attachment, one Spotting attachment, and one Movement attachment. (2Ra/1B/1Y/1G/2W) The Artillery version of the Soldier. This mech works best in pairs. Stage each mech (Direct Fire +1) units apart from each other. This allows each mech to spot for the other as they work their way through the battle field. Mega-Soldier: You can use the Mega-Soldier's three SSRs one at a time to give it an extended punch. Or, you can use them all at once to make sure that dangerous opposing mech gets hit hard and stays down. Since how to build your mecha company has been previewed on the Mobile Frame Hangar, maybe we should start talking about sub-optimal combinations. 1.) Having Double Weapons at two different ranges. It is possible to do but, as you can only attack at one range at a time the unused weapons end up acting as armor without the benefit of rolling a blue die. 2.) Carrying this combination: HtH/Direct (3Rh/1Rd) and Direct/Artillery (1Rd/3Ra). It may give you at least two dice at each range but, as above, at least two ranges are going to remain unused. There may be one tiny way to make this combo work under one special situation. Otherwise, it's #1 all over again. 3.) Having a split Direct/HtH weapon along with another HtH weapon without a Movement attachment in a front line combatant. If you don't have the movement to get into HtH range you're only rolling one die at range. And that's futile. These are the first three I've thought about. Number three was actually proven during the PAX East demo games. 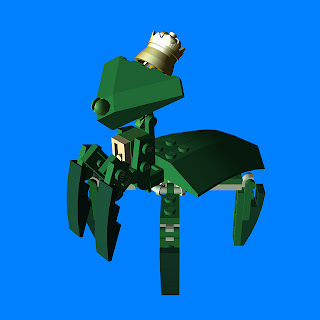 Some time last year Gnomick/Cid Kraken, over in the [Mechaton] Frame Design topic on RPG.net Other Games sub-forum, put together three simple mechs using the 7977 Seabed Strider set. As can be seen here. The closest I've come to that is my SpAAT frame. With Memorial Day and the long weekend coming up here in the States, I'd like to propose a little challenge. Pick a small to medium size set, it can be any set old or current, and build any number of mechs from that set. 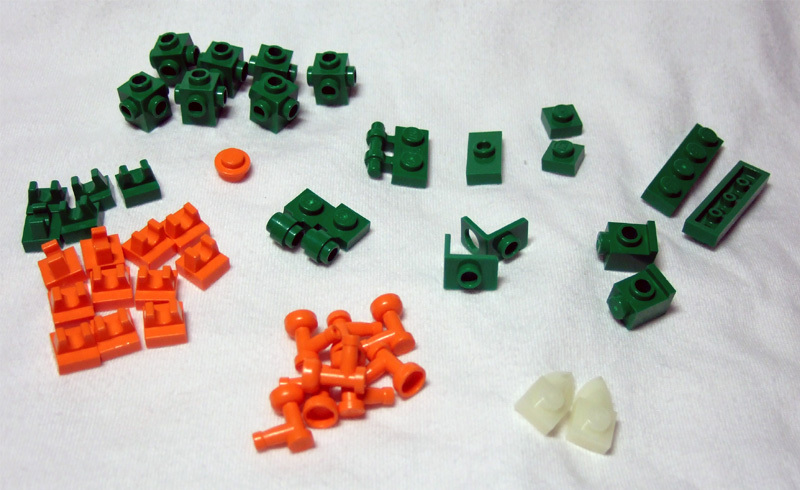 You don't have to use all the parts but you have to use only those parts in the set. To keep things fair, I say everyone goes by the Bricklink Catalog set lists. You can do this "in the brick", on LDD, LDraw, or any old way you can manage put some bricks together. You can post a link to your results in the Comments section of this page. You can also post a picture to the Flickr group, the Hangar forums, or the Facebook group as I'll be cross-posting this challenge to those sites as well. I look forward to seeing what people build. In a pre-emptive move to combat bloat in the "Blog" and "Support Sites" sidebars of my blog I'm going to trim them down to the most active blogs and what I feel are the most useful sites for the community. Fret not, though. I've compiled all the links into a single page broken down by type. As long as the community continues to grow I'll continue to add to the page. As always -- if you don't see something on there that you think I should know about, let me know. As seen here, I came up with a rule mod for those characters seen in anime with psionic/magic powers that pilot giant robots. After further thought on the subject I've come up with another modification. To model a mecha that contains systems to enhance the pilot's power the mecha must dedicate one system to that purpose. This is similar to the Exotic Terrain/Environmental Systems optional rule on page 96 of the rulebook. If this system is discarded to damage then the pilot can no longer roll Purple dice. Created by WangTech based on the Slither frame. I did a multi-keyword Google search for MFZ this afternoon and found a number of related sites. A Tumblr called Tagged/Mobile-Frame-Zero. Looks like Carbonbass has posted a lot to it. 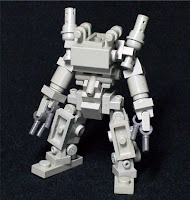 A Pinterest site called Mobile Frame Zero Mech Instructions. 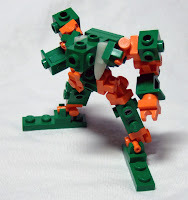 Another Pinterest site called Badass MoF0 Mecha Frames. A blog post about MFZ on La Cueva Del Lobo. Another new blog, called MFZ Homebrew Rules, specializing in -- you guessed it -- new rules for MFZ. Looking through my traffic sources I found a link to FullBroadsides.Com/MobileFrame. It's one page with a few pictures and a brief mention of MFZ. Welcome to the community Thaddeus. While most MFZ newcomers haven't heard of Zizy most have been exposed to Squieu's work. Which is odd because Zizy does more microscale building in a scale that matches MFZ. A lot of people, new and old, are using Squieu's Mini-Frame as the starting point for their work. I think this is the best view of the frame to give you an idea of how it's built. It's almost possible to build it in LDD but it does feature some "illegal" connections. Mitten Ninja has based his first three frames on the Mini-Frame. Squieu's other frame, the Takafashii, seems to get less notice though. Even though it has a parts breakdown. It'll be interesting to see what else people come up with based on these Frames. Evolutionaries: A MFZ Rule Mod. Concept: As put forth in the many variations of the Gundam series, Newtypes -- or Evolutionaries, as I'm calling them, are the next step in human evolution. Spending more time in space has opened the minds of certain people to the Cosmic. This allows them to do more. Mechanics: Evolutionaries use the fabled Purple die! They can substitute this die for either a Red or Blue die when rolling their dice for the turn. They can also substitute a Purple die for one of their White dice to execute a Push. A Push is exactly what it sounds like. The Evolutionary can push a mech that is engaged in HtH with their mech X units away. X being equal to whatever was rolled on the substituting die. Any dice rolled by the Evolutionary cannot be lost due to damage done to the mech. They belong to the pilot, and the pilot alone. Cost: A Level 1 Evolutionary rolls a 1d6 Purple die and cost two (2) Victory Points/Initiative. A Level 2 Evolutionary rolls a 1d8 Purple die and cost three (3) Victory Points/Initiative. A Level 3 Evolutionary rolls 2d6 Purple dice and costs five (5) Victory Points/Initiative. A Level 4 Evolutionary rolls 1d6 + 1d8 Purple dice and cost six (6) Victory Points/Initiative. A Level 5 Evolutionary rolls 2d8 Purple die and cost eight (8) Victory Points/Initiative. Note: I just came up with this last night and it has not been playtested. A video podcast interview with Malcolm Craig and Joe Murphy at Conpulsion. The sound is a little dodgy but, the content seems good. c0d3monk33 over on the MF Hangar forums has a blog called Tabletop Terrain where he's recently started blogging about MFZ. I'm not sure if it's a permanent change but, it's nice to see someone else joining the chorus. For all the people out there that were asking why Vincent, Joshua, Soren, et al. didn't pursue the CUUSOO option, read the new Brand Standards post on the CUUSOO blog. If you're a backer of the Kickstarter. Rock on MoFØs. ETA: Okay. Since Tycho and Zeekhotep have both "spilled the beans" to the general public, I will too. This one's at Reddit. Quade81 has such nice things to say about my blog. Hellcyon was a comic book limited series written and drawn by Lucas Marangon and published by Dark Horse Comics that never finished. Originally designed to run four issues, due to scheduling problems, only three were released. Luckily, Dark Horse collected it into a trade paperback which was released back on April 18th. I picked it up the other day in my first visit to a comic book store in four months. I (re)read it that night while riding the T. Since it contains ideas and themes that are similar to those expressed in Mobile Frame Zero I've decided to do a quick review. The book starts with a quick one page "voice over" of a letter being read by the protagonist of the book, Nika McKay, as he is roused from cryo-sleep in a military space vessel. It continues with an introduction to the setting, the colony moon Halcyon 4, and the current political status which is what gives rise to the central conflict of the story. We are then introduced in short order to a small group of characters who will be the central troupe that the story revolves around. Then, with the abruptness of an orbital barrage, all hell breaks loose and our story kicks into gear. The Legion -- from Earth -- and the Colonial Guard -- From Halcyon 4 -- begin to use force on the groups that want a free colony. This drives Nika and his compatriots into hiding and the beginning of a guerilla resistance. The second issue/chapter introduces us to the major players of the antagonist forces. It also gives us more character time with the protagonists and slightly explains how Jackets -- the Mobile Frames of this setting -- work. The third issue/chapter gives a few Jacket fights seperated by a montaged time jump forward. The fourth (unpublished) issue/chapter gives us more character moments as we meet the leaders of the resistance, the decisive Jacket fight, and a final wrap-up. Overall I found this is an enjoyable book. The characters are easy to understand, the art was in my sweet spot, and the plot was straightforward. There are some flaws with it though. There are characters that are introduced and not really fleshed out. There are events that happen off camera -- important to the plot -- that we are only told about, never shown. I feel that an extra issue or two could have given the story room to expand and be told properly. I also have minor quibbles with the art. Some of the Jackets look too similar. The artist probably thought they were distinct in his head but they didn't look that way to me. There's a reason the protagonists in giant robot anime are different colors. Other than that, I thought it was a good read. While most sources of inspiration for MFZ are anime I feel this book has good potential as inspiration. The two sides in this book could give people an idea what some of the motivations behind the Solar Union and the Free Colonies are like.